Bloomberg TV's 5 p.m. show "With All Due Respect" will replay at 6 p.m. on MSNBC, weeknights starting in January, a Bloomberg spokeswoman confirmed Sunday night. The highly unusual show-sharing arrangement will be formally announced on Monday morning. The deal had been in the works for weeks. MSNBC's 6 p.m. ET time slot -- a crucial hour that leads into prime time -- was vacated by Al Sharpton three months ago. Replacing a fiery liberal talk show host like Sharpton with the insidery duo of Mark Halperin and John Heilemann is a statement by Andy Lack, the chairman of NBC News and MSNBC, about his vision for the cable news channel. Lack is in the process of remaking the channel, seemingly away from partisan opinion and toward political news. Lack was previously an executive at Bloomberg TV. And Heilemann and Halperin are regulars on MSNBC's "Morning Joe." So the deal isn't necessarily surprising, but it's still somewhat head-scratching. Bloomberg isn't rated by Nielsen; there's scant evidence that "With All Due Respect" is a ratings draw. MSNBC already has its own political talk show, Chuck Todd's "MTP Daily," at 5 p.m.; "With All Due Respect" is a competitor. And Bloomberg TV as a whole is a competitor to MSNBC's sister business news channel CNBC. In the critical corners of Twitter on Sunday night, observers suggested that the programming move made MSNBC seem desperate and "out of ideas." 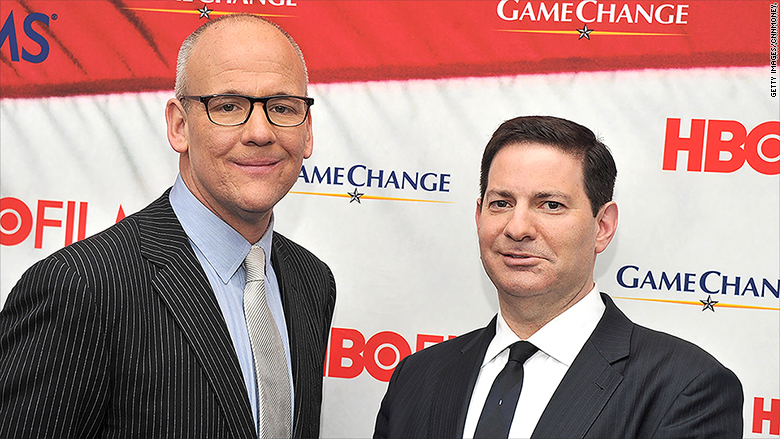 On the other hand, the move deepens MSNBC's relationship with Heilemann and Halperin, two of the best-known and best-sourced political reporters in the business. CNNMoney's Dylan Byers noted in mid-November that their show has been "very successful in booking Republican presidential candidates (a challenge for the historically liberal MSNBC)." In a statement published by The New York Times on Sunday night, Lack said, "I've known and respected Mark and John's work for many years. Collaborating with them on our air will strengthen our already deep and experienced political lineup as MSNBC heads into a pivotal election year." The scheduling move was announced internally shortly after the Times story came out. "Morning Joe" host Joe Scarborough celebrated the announcement on Twitter, saying, "This is great news! Mika and I are very excited to have #WADR on board!"